Toasting Earth Day in an Earth Day Mug? Searching for "Earth Day Merchandise" brought up thousands of commercial hits on Google: t-shirts, hats, mugs, etc. Some of this is arguably for the better - if you replace your throwaway cup with a mug you bring to your favorite coffee shop each and every time, you will undoubtably be helping the planet. Americans throw away a staggering 25,000,000,000 Styrofoam cups every ear. Even 500 years from now, a foam coffee cup used this morning will be sitting in a landfill somewhere. And Earth Day cloth bags, if used regularly, will keep tons of plastic or paper bags out of our resource use and waste stream. But a lot of the Earth Day merchandise is simply more stuff we don't need (and don't need to manufacture, ship, advertise, etc. ), and it promotes the idea that for any occasion we should be buying stuff. The folks at the Huffington Post have a great article about Earth Day Marketing to kids. Check it out! After the People magazine article came out, our local news station came and did a piece about it. I think they did a really nice job. It's great to see lawns-to-gardens getting so much coverage! Although I don't consider myself any kind of gardening expert in any way, it's nice to think that our experience might somehow inspire others to also give it a try. I especially love the first line: "A Eugene family is featured in this week's People Magazine, not for red carpet fashion or celebrity scandal, but for their vegetable garden." Here's the link to the story. Hah, I got a kick out of John K's post about Chick Butts over on The Outdoor Journey. I simply love his blog because there's so few people out there who combine my love of triathlon with a nerd's eye to the nitty-gritty science of sports, along with urban gardening and urban sustainability. I was sure I had a post about chick butts somewhere here on my own blog, and I found it, from May of 2006. Fortunately, we've somehow been doing something right with the last couple of batches of chicks because none of them have pasted up like the first batch. We don't get our chicks from mail order, and maybe that helps with the whole issue. I also make sure to really change out their water so that they all drink a lot, and we feed them chick starter instead of the layer pellets that the mature hens are eating. Whatever it is, it seems to be working since I haven't wiped a chick bottom in a couple of years. Our newest couple of chicks are getting along towards full-grown and we're about to move their outdoor pen into the bigger chicken enclosure to start getting them used to the full-grown hens and vice versa. For those who have asked, I haven't been able to find the gardening article online at People magazine's website. Maybe it's just not up yet, but the site is different from the magazine by a fair bit. Yes, it's officially hit the big mainstream, People magazine has an article on urban gardens, showcasing folks who have turned their lawns into veggie gardens and of course including Michelle Obama's new garden on the Whitehouse lawn. It's very exciting to see this trend not just in the latest issue of Permaculture Magazine but somewhere that it has the potential to be seen by (and influence) millions more mainstream Americans that might not otherwise be thinking about urban gardening. 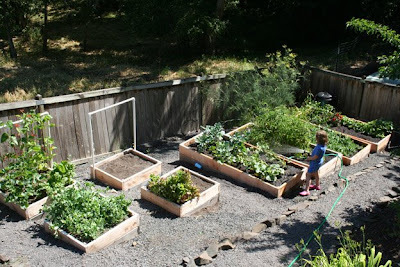 And of course, I might just be mentioning this because our raised beds and my two cute kiddos are in the article! On newstands everywhere, today... the Blue Skies Urban Farm (no kidding, April Fool's Day is long past). Even one of our chickens, in People magazine, rubbing feathers with the celebs. 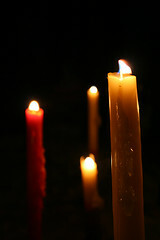 Earth Hour: Candle in the Wind??? I remember my first experience with Earth Day, in the early 1980s, only a decade after its inception. Although Ronald Reagan was president, and James Watt, the U.S. Secretary of the Interior, was busy selling off public lands to private corporations and decreasing funding for environmental programs, there was still an atmosphere of hopefulness about those earlier Earth Days. Many people knew the problems that were emerging from energy use and overconsumption of resources, but we still had plenty of time to raise awareness and turn things around. Earth Day was a symbol of that hope and change. So shoot me, my family didn't celebrate Earth Hour. We didn't turn out light switches off, only to burn candles or oil lamps for our light instead. I know it's supposed to be symbolic and all that, but even the symbolism is flawed. After all, that candle still consumes resources. It was made somewhere, shipped in a truck, people undoubtably drove to stores to buy them especially for Earth hour. Call me jaded and cynical, but I just can't buy into it anymore. It's time to make every hour Earth Hour. Either that, or rosin up your bow.